Our organization is graded amidst advanced traders of the product in Nagpur(India) as well as diverse marketplaces. Each consignment of ours is packaged carefully utilizing premium packaging supplies and technologies in order to maintain the products' environment and quality during shipping and handling. 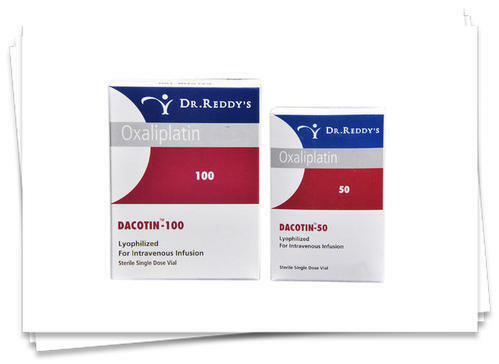 Decotin(Oxaliplatin) is a platinum-based cancer chemotherapy drug. These drugs are usually classified as alkylating agents, although they are not capable of actually adding alkyl groups to DNA and simply work by a similar mechanism. Oxaliplatin is typically administered with fluorouracil and leucovorin in a combination known as Folifox for the treatment of colorectal cancer. Oxaliplatin is marketed by Sanofi-Aventis under the trademark Eloxatin or by Medac GmbH under the trademark Oxaliplatin Medac. There are generic equivalents on the market now.